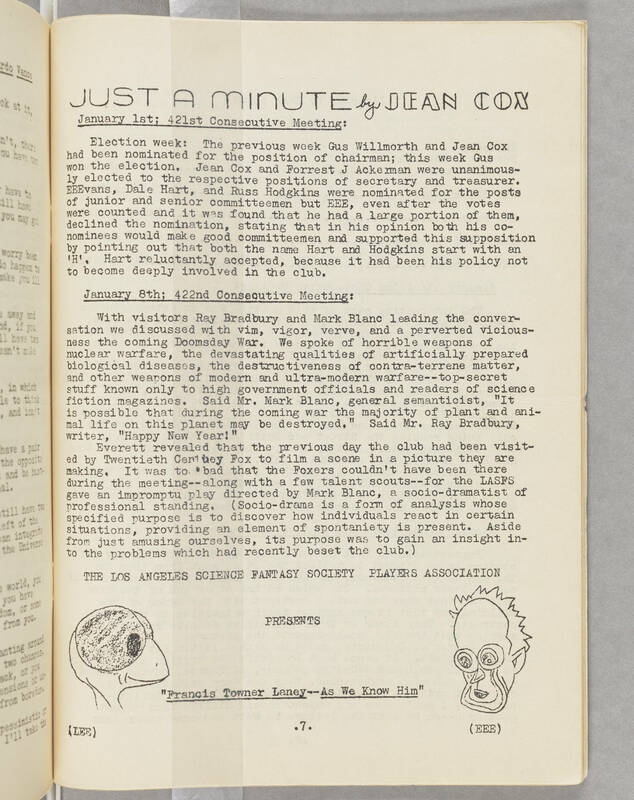 JUST A MINUTE by JEAN COX January 1st; 421st Consecutive Meeting: Election week: The previous week Gus Willmorth and Jean Cox had been nominated for the position of chairman; this week Gus won the election. Jean Cox and Forrest J Ackerman were unanimously elected to the respective positions of secertary and treasurer. EEEvans, Dale Hart, and Russ Hodgkins were nominated for the posts of junior and senior committeemen but EEE, even after the votes were counted and it was found that he had a large portion of them, declined the nomination, stating that in his opinion both his conominees would make good committeemen and supported this supposition by pointing out that both the name Hart and Hodgkins start with an 'H'. Hart reluctantly accepted, because it had been his policy not to become deeply involved in the club. January 8th; 422nd Consecutive Meeting: With visitors Ray Bradbury and Mark Blanc leading the conversation we discussed with vim, vigor, verve, and perverted viciousness the coming Doomsday War. We spoke of horrible weapons of nuclear warfare, the devastating qualities of artificially prepared biological diseases, the destructiveness of contra-terrene matter, and other weapons of modern and ultra-modern warfare--top-secret stuff known only to high government officials and readers of science fiction magazines. Said Mr. Mark Blanc, general semanticist, "It is impossible that during the coming war the majority of plant and animal life on this planet may be destroyed." Said Mr. Ray Bradbury, writer, "Happy New Year!" Everett revealed that the previous day the club had been visited by Twentieth Century Fox to film a scene in a picture they are making. I twas to bad that the Foxers couldn't have been there during the meeting--along with a few talent scouts--for the LASFS gave an impromptu play directed by Mark Blanc, a socio-dramatist of professional standing. (Socio-drama is a form of analysis whose specified purpose is to discover how individuals react in certain situations, providing an element of spontaniety is present. Aside from just amusing ourselves, its purpose was to gain an insight into the problems which had recently beset the club.) THE LOS ANGELES SCIENCE FANTASY SOCIETY PLAYERS ASSOCIATION PRESENTS "Francis Towner Laney--As We Know Him" (Lee) (EEE) . 7 .